The MARTINI DIVA: What's Better Than A Chocolate Martini? New Nano Story #5! What's Better Than A Chocolate Martini? New Nano Story #5! 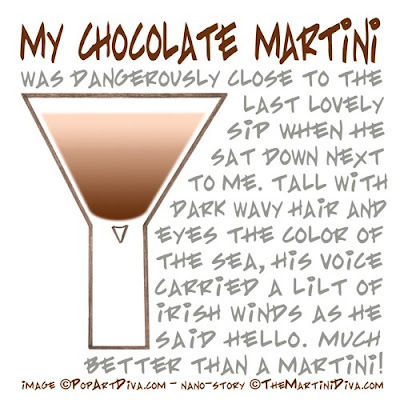 Number Six in my series of itty bitty illustrated short stories of martini fiction! Take a short break from your everyday life and ponder the wonders of the "cocktale" world. A novel ideal for happy hour from The Martini Diva. MAY LIFE BRING YOU CHOCOLATE, MARTINIS AND LOVE! Tees, Snack Bowls, Aprons, Pillows & More! Goodies start at under $5!